The late 19th-century Harlem contractor John J. Hopper reminisced about this church in his series of Manhattanville history newspaper articles, circa 1920, as “the German Catholic Church at Ninth Avenue, which my father [Isaac A. Hopper] built” during his boyhood on Manhattan Street [now 125th Street] from 1853 to 1865. 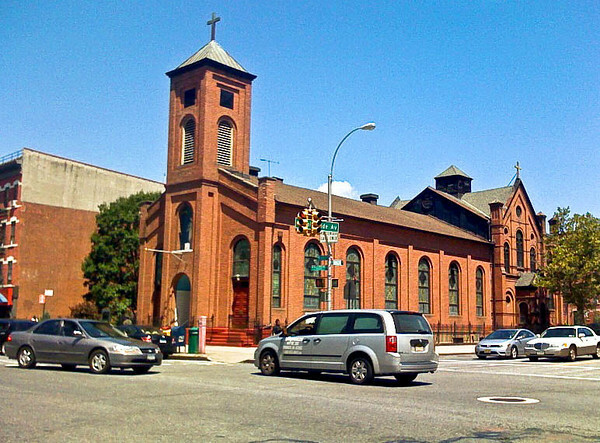 Although the AIA guide attributes the church’s architecture to the Herter Brothers in 1889, that building date is incorrect, probably confused with that of St. Joseph's ancillary school building around the corner at 168 Morningside Avenue; architectural historian Sandra Levine attributes the architecture to Henry Engelbert. David Dunlap cites this church in his book, “Glory in Gotham: Manhattan’s Houses of Worship,” as the oldest church in Harlem, but that observation would apply only to the building itself. The honor of Harlem's two oldest local congregations belongs to the Elmendorf Reformed Church (established in 1660 as the Reformed Low Dutch Church) in what is now called East Harlem, and nearby St. Mary's Protestant Episcopal Church Manhattanville, established in 1823.